Cherokee America is an American epic set in the old Cherokee Nation West. It is a multi-ethnic, multi-generational saga centering around the title character, Cherokee America Singer. The book, historical fiction, is based on the lives of real people and is set in 1875. "'Cherokee America' is an essential corrective to the racially tinged myths created to justify the annihilation of indigenous cultures and the theft of native lands. The pacing of the novel mimics the rhythm of a Cherokee neighborly visit: conversation about the weather, crops, family and gossip before getting around to the real point of the call. No matter what was discussed, no matter what was resolved (or not resolved), there was joy and satisfaction in spending time with friends and family. That's how you will feel about Check and the other characters by the end of the novel. You're invested in them, their culture, their life. Verble has given historical fiction lovers a real gift: "Cherokee America" is an excellent illustration of how diverse books enrich literature, and the minds of those who read them." - Melissa Lenhardt, New York Times Book Review. 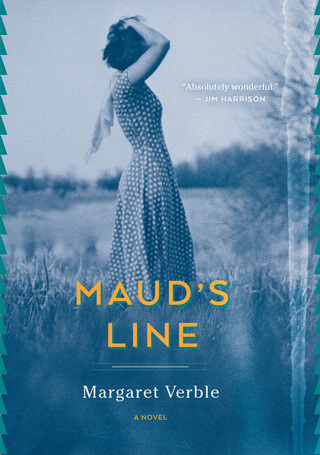 Maud’s Line is set in 1928, a year after the worst flood in American memory and a year before the stock market crash and the start of the Great Depression. The heroine, Maud Nail, lives at the end of a lane at the end of a section line on Indian allotment land. She shares her home with her father, Mustard, who can’t stay out of a fight, and her brother, Lovely, who is sensitive and in love. Maud’s prospects, both for love and for living with electricity and in-door plumbing, are limited until a bright blue canvas-covered peddler’s wagon rolls down her section line and stops in her lane. The wagon, driven by Booker Wakefield, a teacher looking for adventure on summer break, is loaded with trinkets, necessities, and books. Maud, who is a reader, is taken both with the peddler and his merchandise. But Maud’s world is filled with violence and Booker’s life has been sheltered. The events of the book cause friction between them, and Maud has to take comfort where she can find it and call on her wits and reserves of strength to survive.